If you haven't been tuning into The Barn Blog lately, you've missed out on getting to know some of our amazing staff members! You can read all about Lea, Cindy and Victoria, and today, you get to meet Kelsea! Kelsea Mahoney is a Junior Planner at The Barn, and she's our newest staff member. Kelsea says she's "kind of a mutt." She was born in Orlando, but moved away when she was three weeks old. She spent most of her childhood and early teens in Texas, and she graduated from high school in Benton, Arkansas. She went to Arkansas Tech University, where she received a Bachelor of Science in Hospitality Administration with an emphasis in Event Management and Tourism. She lives in Dardanelle with her boyfriend, Alan, and his children. "I love to cook, bake, and sing as hobbies," she said. "I love to travel and be outdoors. Oh, and as a Hospitality graduate, I love being a part of events and special occasions!" The following photos are from two of Kelsea's favorite styled shoots and weddings. "First off, I'm in love with the Wild West Gypsy shoot," she said. "I'll never not love those details. I'm also partial to the details of my Breakfast at Tiffany's styled photo shoot! Mostly because I got to plan and detail and see the work come together!" She also loved Morgan and Wager's altar, and Brittany and Skylar's "bayou bash glam fab wedding," she said. "I made that up, but just check out the flowers... Would ya just look at it!!" Totally agree, Kelsea! Kelsea started working at The Barn as an intern about a year ago. "I had no previous experience before I began working at The Barn last August," she said. "I was quite nervous when I began working at The Barn because I really had no idea what to expect from weddings, but now I love it and feel like I can conquer them all!" Kelsea said a normal day at The Barn for her is one word: sweaty! "It's the ugly part that our couples and their families don't have to experience," she said. "My co-team members and I work almost year round to maintain the grounds and facilities at The Barn, because the execution of one of our prestigious weddings isn't just the decor and flowers, it's making sure everything works and is kept! More often that not, we come home tired from a normal day's work, but it is all worth it. We have a great sense of pride and accomplishment in our work at The Barn and the dirty work is just part of it!" Kelsea's favorite things about her job: "getting to work outside (I know I said it gets sweaty, but still beats sitting at a desk! ), getting to meet new faces, networking with local, statewide, and beyond vendors, and most of all the genuine appreciation that comes from the newlyweds and their families," she said. "It's always rewarding to know that your hard work paid off. Oh, and I can't forget the individuals I get to work with. They're my favorite, too." "I don't always love hard work, but I enjoy it," she said. "And I enjoy seeing the results of our hard work. We have an amazing team, an amazing leader, and an amazing vision. We're always striving for the best, and I'm proud to be a part of that! #barnluv"
Amen, Kelsea! I've mentioned several times over the last few weeks that what these ladies do is NOT always pretty. It's difficult work, and it's almost as hot as Satan's kitchen in Arkansas this summer, soooo... These gals have had it kinda rough. BUT, their hard work makes every wedding look effortless and flawless. It all pays off! I am so proud of them for everything they do to keep The Barn looking beautiful and to make every wedding unforgettable! Kelsea is such a hard worker, and she's also a hoot! 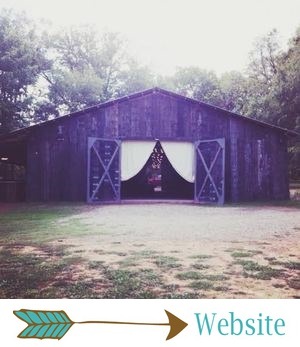 She may be new-ish to The Barn and to weddings, but she will make all your wedding day dreams come true if you have the pleasure of planning with her!